The trust responsible for one of the UK's largest teaching hospitals will be placed in special measures after it was rated inadequate. St George's University Hospitals NHS Foundation Trust was told by the Care Quality Commission (CQC) that services had deteriorated in the past two years. The trust comprises St George's and Queen Mary's hospitals in south-west London and serves 1.3 million people. It said it had made "real progress" since the June inspection. But interim hospital trust chairman Sir David Henshaw, part of a new leadership team, said: "There will be no quick fix to the problems we face. "Many of these challenges are due to very poor board and senior management decisions in the past and a failure to tackle the big challenges head on. "We owe it to our staff and patients to make St George's better again. The CQC's report is a key part of this improvement journey." The two hospitals employ about 9,000 staff. They were rated as good overall in an inspection in 2014. Prof Sir Mike Richards, CQC chief inspector of hospitals, said: "I am disappointed we have found a marked deterioration in the safety and quality of some of the trust's services since we inspected two years ago, as well as in its overall governance and leadership." The CQC said St George's practised poor infection control, some of its operating theatres were unfit for purpose and there was a risk of water contamination. It also said the trust had to improve building maintenance and identified potential places where children and young people in a mental health ward could hang themselves. 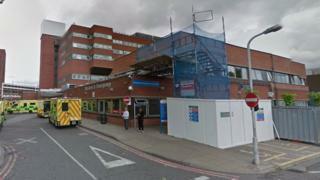 The trust said within hours of the inspection it had made safe the potential areas of harm identified by the CQC in the mental health ward and since June had restarted its previously abandoned estates management programme to refurbish two operating theatres and move outpatient services to other sites. It said a new flushing system had been installed to reduce the risk of water contamination. The trust recently invested £1.3m in a new IT system that crashed for several hours on 6 June, plunging the hospital into "chaos". It also made the headlines in October for volunteering to screen pregnant patients to check they were eligible for free NHS treatment by requiring women to show their passports before receiving non-urgent treatment. NHS Trusts are recommended for special measures when inspectors from the Care Quality Commission rate the organisation as inadequate in terms of leadership and one other key area - such as being safe, effective, caring or responsive. That is normally the cue for another body, NHS Improvement, to step in with a much more hands on approach to the running of the Trust - and means the departure of the Trust's leadership team. So for this to happen at one of England's leading teaching hospitals is significant. Concerns range from the quality of leadership at the Trust to the state of operating theatres, described as not fit for purpose - as well as serious concerns around safety of mental health patients and young people. St Georges is the latest NHS trust to be in special measures, adding to concerns about the resilience of the health service as we head into winter. St George's joins 17 other NHS trusts in special measures for the quality of services. They are: Barking, Havering and Redbridge NHS Trust, Barts, Brighton and Sussex, Cambridge University, Colchester University, East Kent, East Sussex, London Ambulance, Medway, North Cumbria, Princes Alexandra Hospital, Sherwood Forest, South East Coast Ambulance, Walsall, West Herts, Worcestershire Acute and Wye Valley NHS Trust. Eight NHS Trusts are in financial special measures. They are: East Sussex Healthcare NHS Trust, Gloucestershire Hospitals NHS Foundation Trust, Brighton and Sussex University Hospitals NHS Trust, Barts Health NHS Trust, Croydon Health Services NHS Trust, Maidstone and Tunbridge Wells NHS Trust, Norfolk and Norwich University Hospitals NHS Foundation Trust and North Bristol NHS Trust.